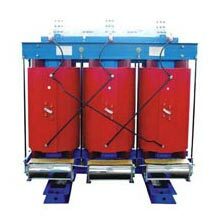 We offer Dry Type Transformer to our clients. Dry Type Transformers are used to minimize fire hazard and environmental contamination. Our Dry Type Transformer is engineered by our highly experienced technical workforce meeting the parameters of power system demands. The Dry Type Transformer that we provide functions well for long without any trouble. Manufactured in accordance with international standards, we offer Dry Type Transformer at the most competitive rates. Clients can avail Dry Type Transformer from us in carious specifications.